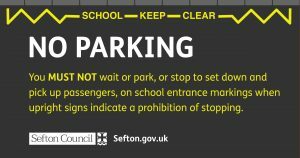 Sefton Council are tackling inconsiderate and dangerous parking outside a number of schools during drop-off and pick-up times. Following the start of the school year, the council has acted upon concerns by residents, teachers and parents who are worried about inconsiderate and often dangerous parking on restricted areas near 26 schools across Sefton. As a result, the five minute observation period, which is usually afforded to cars parked on single or double yellow lines at schools, has been removed. Civil enforcement officers will now immediately issue a penalty charge notice to any vehicle found parked in an area where restrictions are in place in the vicinity of one of the schools identified. “This means that when an officer is patrolling in the vicinity and they see a vehicle parked on a yellow line between 08.15 and 09.15 or between 14.45 and 15.45, they will immediately serve a penalty charge notice. “We hope that this will make the roads around schools a far safer and more pleasant environment for pupils, parents, teachers, and residents alike.